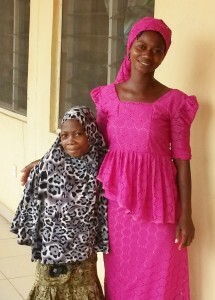 Kaosara is a 10 year old girl who lives with her parents in a town called Odeomu in Osun State, Nigeria. In November, 2015, she developed rapidly progressive, but painless masses on both sides of her jaw. This was mistaken for parotitis, an infection of the salivary glands, which is often referred to as mumps. Mumps is called “shegede” in the local language where Kaosara lives. According to traditional treatments, Kaosara was asked to mouth-breathe into a cracked wall early in the morning as a remedy for her problem. Unfortunately, after one week, there was no improvement and her parents took her to a private hospital where she received additional treatment for about three weeks. However, her condition worsened and she was referred to our facility, the Obafemi Awolowu University Teaching Hospitals Complex (OAUTHC) in Ile-Ife. When she came to our hospital in early January of this year, Kaosara had marked swelling of both of her jaws and bleeding of the gums. It was difficult for her to swallow, talk and breathe because of the size of her jaw masses. She also had a paralysis of one of her cranial nerves. This particular cranial nerve controls the muscle involved in the lateral gaze of the eye and, when compressed, causes double vision. After confirming the diagnosis of Burkitt lymphoma which was at an advanced stage, we started chemotherapy immediately. After just the first cycle of therapy, her jaw tumors had resolved and she was left with only a slight paralysis of the cranial nerve. During our ward rounds, her mother confessed that this was a big miracle. Her story demonstrates how important it is for a child suspected of having a highly curable cancer such as Burkitt lymphoma to be referred immediately to a center such as ours. Traditional cures were started first which were followed by a lengthy stay in a hospital not capable of making the diagnosis. Although long distances often prevent parents from obtaining appropriate treatment for their children with cancer, in this case, Kaosara’s home town was only a 45 minute drive away from our hospital. Social circumstances also came into play during treatment. Kaosara’s mother, who stayed with her during treatment, lost her income as a petty trader. Her mother received no financial support from the family for Kaosara’s care. Good Samaritans paid Kaosara’s hospital bills and your donations paid for her chemotherapy. Her mother wishes to thank all of you all for your generous support for this project which enables children with Burkitt lymphoma like Kaosara to have hope for cure because now,with the correct treatment, many children can be cured.